Since my goat has been dried off and I am currently waiting for my hopefully (crosses fingers, arms and legs) pregnant doe to kid in April I am without a milk supply at the moment. If it were up to me we would simply go without, but sadly it isn’t. As a result we have had to buy milk recently. While I would prefer to buy goat milk from my local goat dairy, they are all in the same situation I am and have no milk at the moment as they are also expecting kids and their girls are either pregnant or dry. It is that time of year. 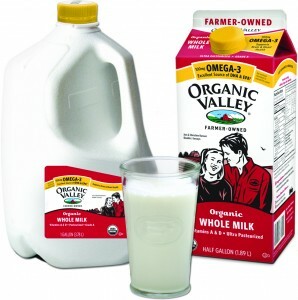 This has, of course, led me to buy organic cow milk from my local co-op. I don’t really drink it except for in my tea, but my kiddo asks for a glass now and then and his father consumes quite a bit of it. When I went to buy the first half gallon I noticed something new in the milk isle. Granted I haven’t paid that much attention for nearly a year since the last time I found myself without a goat milk supply, so maybe this isn’t news to everyone reading. Apparently you can buy milk that has added omega-3’s and DHA in it. Upon reading the back I learned that in the case of the additional omega-3’s and DHA in the Organic Valley version, fish oil has been added to supply them. I beg your pardon? I mean really, who wants milk with fish in it? Then, this morning, I was made aware of something even more disturbing that fish-milk. According to the Cornucopia Institute, Horizon Dairy (not known for their exemplary record in following organic standards anyway) has added synthetic, non-approved DHA and Omega-3’s to their milk and are still proudly flaunting the organic label. Apparently the synthetic additives come from a processed algae source, rather than actual fish like the additives in the Organic Valley version. The problem, of course, is that the synthetic source has not been approved organic and therefor the addition of it to an organically labeled product is questionable. In either case, whether organic fish or questionable algae bi-product, I find the addition of these nutrients to a food like milk highly questionable. Milk is a real food, even in its pasteurized form – though I personally believe raw is better. On the one hand it is somewhat inspiring to see that the recognition of the importance of nutrients like omega-3’s has made such an impact, but on the other hand I don’t understand why the food industry – the Organic food industry even – has decided it needs to mess with something that isn’t broken. It seems to be just another attempt of the industrial food machine to modify a “product” to fit “consumer” patterns in order to make more money. And in the process they have taken a very simple food and given it an ingredient list. Suffice it to say I am going to be very glad when my goat milk supply comes back. I finally got a chance to wax the cheddar that I made this week and thought it would be a good opportunity to show pictures of the finished project. While I do not have an actual cheese press or molds, I have managed to rig something up involving some camp bowls made from stainless steel and a large brick from my garden path. It is rather precarious, to be honest, but it works! Cheese making, like baking, is really all about mastering the art of reading and following a recipe. If you mess up or get sloppy along the way you end up with either an inferior product or a complete failure. Cheddar is one of the more complicated hard cheeses I’ve tried to make because it requires a) the addition of a specific culture and b) slow curd cooking combined with a special process known as cheddaring. This is the act of stacking the curds until the texture changes to that of cooked chicken. Weird, right? The process of making cheddar can be broken down into a few steps. 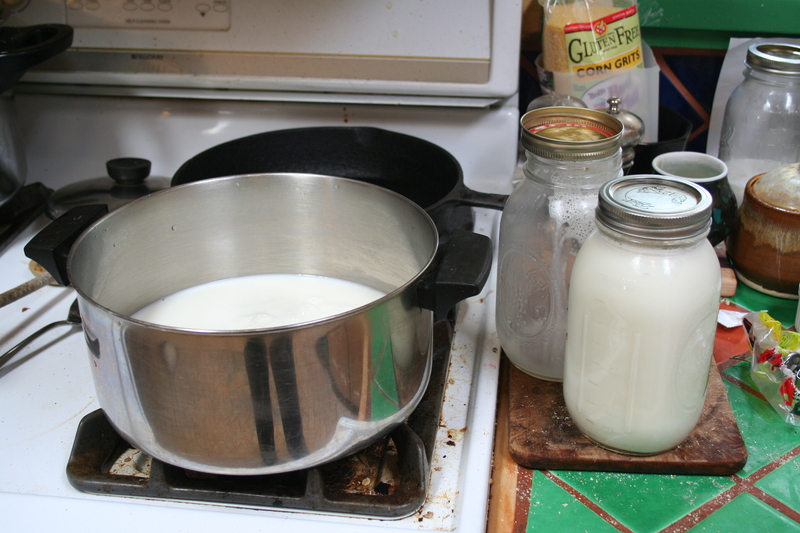 You allow the milk to culture (I use raw milk even though the recipe says to pasteurize it), bring to 86 degrees, add your rennet and let it set a curd for about 45 minutes. Then you cut them and slowly cook the curds to about 110 degrees over the course of an hour. At which point you strain them for a few minutes, then cut them again into four pieces, stack them until they achieve the chicken consistency mentioned above, cut them again then press them for about 24 hours. At this point you let your cheese wheels form a rind, then you wax them. This is a huge over-simplification of cheddar making and I urge readers NOT to attempt to make cheddar from the above instructions. 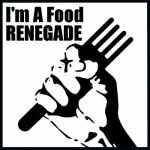 The web site I had been using is currently offline, however here is the link and hopefully it will come back up so anyone interested in doing this themselves can follow more detailed instructions. The real bummer about making cheddar is that once you have it waxed you have to let it age for about three months before you can eat it. So even though I have these lovely cheese wheels, I cannot eat them until January of next year. So I have no idea what it tastes like or if it is even edible. 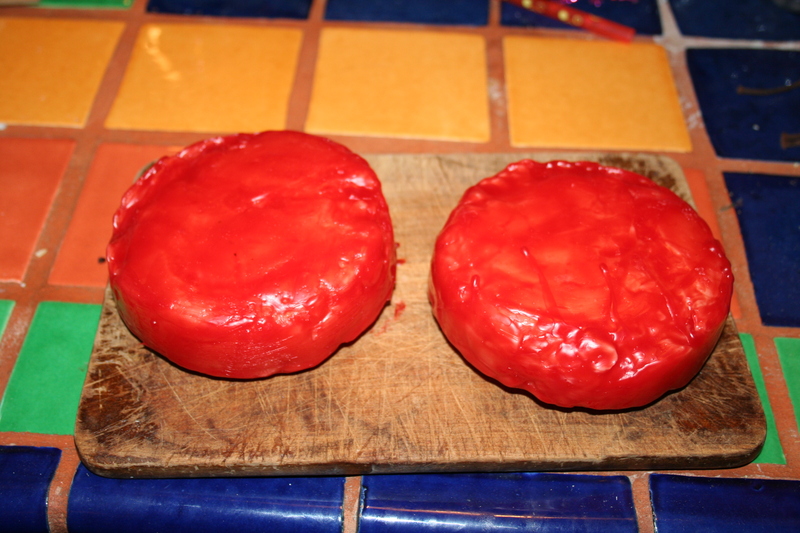 Luckily cheese wax is fairly inexpensive and I can buy it locally at Santa Fe Homebrew Supply where they also reassure me that it can be reused. So, I will try to get back to you all about this in January and let you know how the cheddar worked out! Hopefully it will be worth the wait! Until then, Happy Eating. The summer milking routine is in full swing here and my first time goat mommy is providing an over-abundance of milk. Giving us nearly a gallon a day, she has successfully added a new chore to my list: cheese making. Home cheese making is a combination of rewarding and tiresome, at least at this point in the process. The basic problem I face is the size of the batches. I am forced to make cheese one gallon at a time, primarily because I lack a pot large enough to hold more than one gallon of milk. And while I would love to invest in a huge pot reserved solely for making cheese, I have yet to do so. In fact, generally speaking cheese-making is instrument heavy. There are all sorts of things you need – the right cheesecloth (especially for ricotta), slotted spoons, large pots, thermometers, multiple bowls and strainers for catching whey, somewhere to hang your cheese while they dry, cultures, rennet…the list could go on but I don’t want to alarm you. In truth cheese making is not difficult, it is simply procedure intensive. It is like chemistry…if you skip a step or get sloppy, your cheese could potentially explode. (Okay not REALLY, but it could get moldy and smell funny…which is nearly as bad). There are a variety of recipes out there on the internet for making your own cheese. 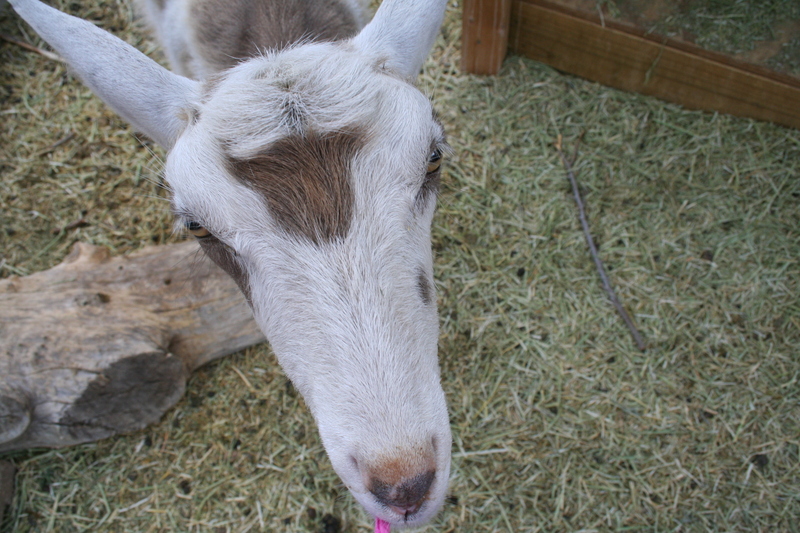 One of my favorite sites is Fias Co Farm, a web site dedicated to all things goat, including cheese making. Some of the recipes are very simply and it is a great introduction to making your own cheese at home, regardless of whether you are using fresh goat milk from your own animals or not. In general, cheese making follows some basic steps, with modifications to temperature, time and cultures making up the bulk of the differences in the end result. Basically you bring the milk to temperature, add a culture if necessary (for things like cheddar and feta cultures or even yogurt are added to allow the ripening to occur properly) then left to ripen for about an hour. At this point the rennet is added and the curd is allowed to form – again, the time allowed for this depends on the cheese. The curd is then cut, rested and brought up to the appropriate temperature during the “cooking” phase. 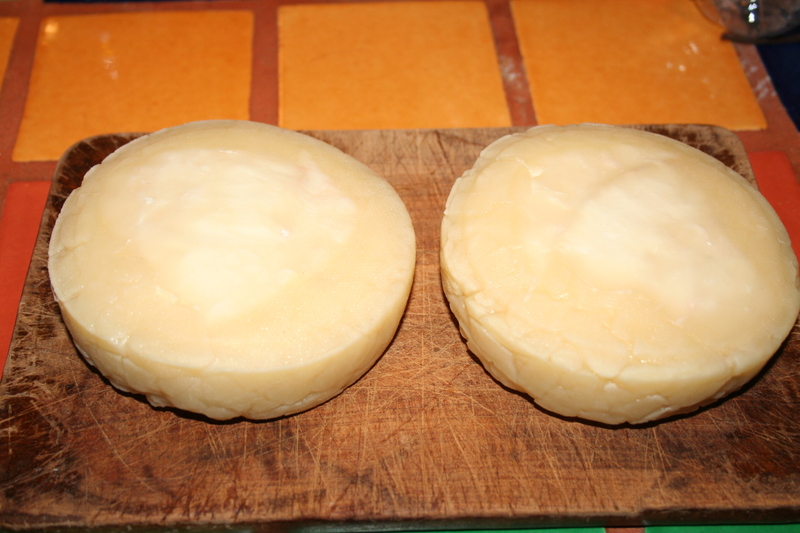 The temperature affects the firmness of the curd and thus the firmness of the final cheese. The curds are then strained, salted, hung, pulled, or pressed and you end up with your final result. So, like many things culinary, cheese making isn’t necessarily difficult, however it is time consuming and it does require basic direction following. Cheese making is not an area where experimentation is an asset – at least not at the beginning. All this being said I have successfully made mozzarella, farmers cheese, fromage blanc, cheddar (I think…I won’t know for about 3 months how successful it was…), and feta. All in all, I enjoy the process and really enjoy eating the results. So here is a very basic recipe for a paneer like cheese (for those of you not familiar with Saag Paneer, a favorite Indian dish of mine, paneer is a firm cheese with a consistency similar to tofu. It does not melt and can be used in pretty much any way tofu can). Bring one gallon of milk up to 160 degrees over direct heat, stirring regularly to ensure the milk is heated evenly. Once at temperature, remove from heat and add 1/4 white vinegar, stirring until well mixed. You will notice that the milk will start to separate right away. Let cool for a few minutes so as to allow for the curds to separate fully as well as to avoid burning yourself during straining. 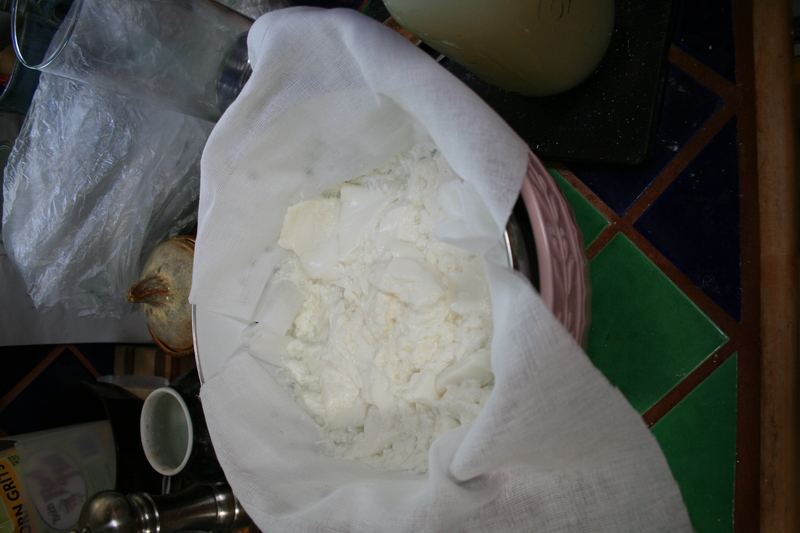 Strain the curds through a colander lined with cheesecloth that you have resting over a large bowl or another pot. Catch and keep your whey so you can make ricotta. Let the curds drain overnight. The end result should be a firm cheese that resembles tofu in texture. One of my favorite ways to serve this cheese is to cut it into cubes, dredge it in flour and fry until it is golden brown. Then I sprinkle it with a little salt and pepper and voila! A perfect snack!